Leading access equipment provider, HAKI Scaffolding has just secured a significant multi-million-pound investment from Enigma Industrial Services Ltd (formerly Interserve Industrial Services). The purchase involves more than 2,500t of scaffolding equipment, making Enigma one of the largest stock holders of HAKI Universal in the UK. 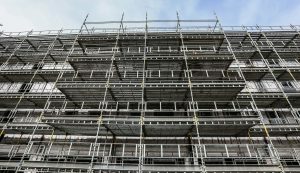 Details of the deal were announced this week via HAKI Scaffolding’s parent company, Midway Holding AB, who revealed Enigma Industrial Services would be making a “considerable asset purchase” consisting of HAKI Universal Scaffolding and various HAKI stair tower systems and loading bays. The large-scale purchase is from ’consigned’ long-term hire stock, as used on recent projects, such as The Ropeworks in Edinburgh, maintenance contracts, such as the Syngenta Manufacturing Site in Yorkshire and multiple housing, office and student accommodation developments throughout the country. The deal has been brokered by HAKI Scaffolding UK’s Chris Stokes, working with Enigma Industrial Services MD, Scott Hardie and Procurement & Asset Management Director, Alan Scott. “This deal is fabulous for HAKI and represents great business for Enigma Industrial Services too. It cements the relationship between Enigma and HAKI and supports the ongoing collaboration on some of the UK’s biggest and brightest projects.